Chip Estenes was well on his way to weighing 500 pounds. Then he made a decision that changed his life. Francis “Chip” Estenes, 49, weighed 425 pounds when he made the decision to undergo bariatric weight-loss surgery at Bon Secours Community Hospital, a member of the Westchester Medical Center Health Network (WMCHealth) in Port Jervis. 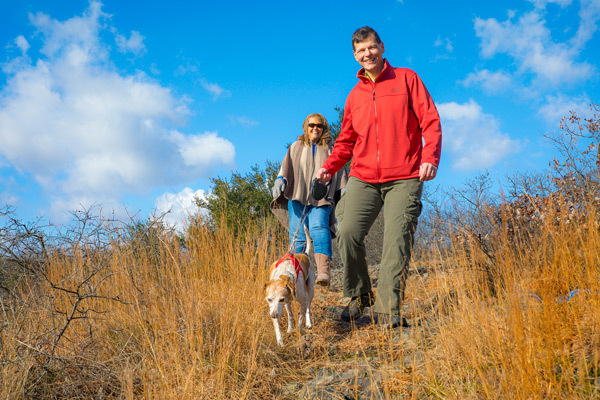 Following his doctor’s recommendation, Estenes called Bon Secours and, after soul searching, prayer and research, had a laparoscopic sleeve gastrectomy, in September 2016. Seven months later, he ran his first of many 5K races that would follow. “Before, I was always on the sidelines, cheering and thinking, I want to be one of those runners. Crossing the finish line brings feelings of joy, achievement and accomplishment,” says Estenes, who lives in Port Jervis with his wife, Kelley, and their rescue dog, Sally. “Surgery is really a small part of the process. It’s not what makes a patient lose weight; it’s the tool with which patients can modify behavior and diet to achieve weight loss,” says Estenes’ surgeon, Peter Kwon, MD. Estenes’ surgery — one of more than 600 bariatric surgeries the team at the Surgical Weight Loss Institute performs annually at Bon Secours Community Hospital and Good Samaritan Hospital, both members of WMCHealth — was performed at Bon Secours Community Hospital. Under the leadership of Bariatric Medical Director Jaime Cepeda, MD, the Institute is accredited by the American College of Surgeons (ACS) and the American Society for Metabolic and Bariatric Surgery (ASMBS) and has received a five-star rating for excellence from Healthgrades, a leading online healthcare resource. 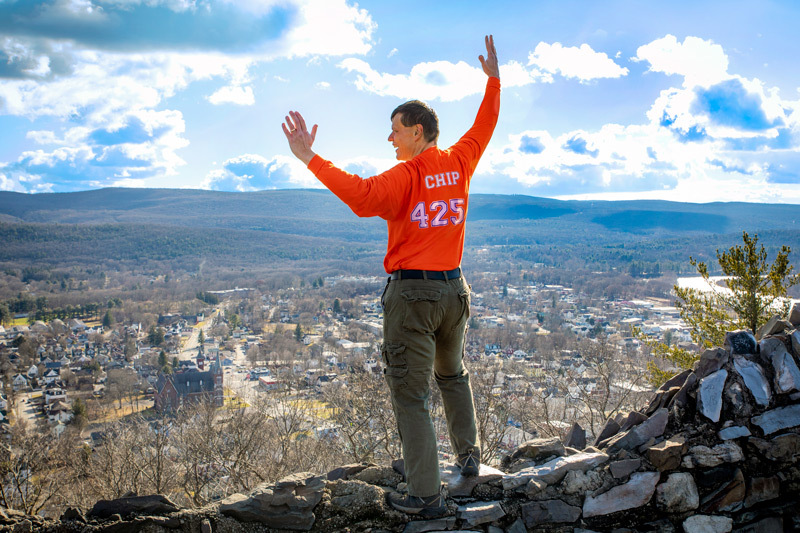 Chip, an Ambassador for the Outdoor Club of Port Jervis, can now enjoy hiking with his wife, Kelley, and their rescue dog, Sally. A prospective patient’s first step is to attend an in-person or online seminar, to engage with the full, multidisciplinary team — not just the surgeon. They then meet with the clinical team and receive instructions, including extensive preoperative evaluations for uncontrolled diabetes, cardiac issues, sleep apnea, psychiatric health and more, to ensure they are good surgical candidates. The sleeve gastrectomy typically takes 45 minutes and is the most commonly utilized in three types of bariatric surgery. Most patients have a one-day hospital stay and return to work in two weeks. “Chip was a very compliant patient, an ‘A‘ patient, who excelled above and beyond the average. He’s a diligent attendee of the support groups we offer, both before and after surgery, and is quite inspirational to others,” says Dr. Kwon. Estenes, a caseworker for troubled youth and families, says these welcoming support groups made him feel like part of a family. “Becky [Aschoff, RN, BSN, CBN], who runs my support group, came to my first 5K run and was at the finish line, in the rain! If that isn’t support, I don’t know what is,” he says. “I feel 1,000 times better, and it’s incredible — liberating, like a rebirth,” says Estenes, who by January 2019 weighed 215 pounds and admits he was surprised to lose more than 200 pounds in his first year following surgery. To reflect his personal weight-loss journey, Estenes designed a special shirt. Estenes now enjoys bike rides, gym workouts and hiking. In fact, he’s an Ambassador for the Outdoor Club of Port Jervis, providing guided beginner hikes to the public in the Port Jervis Watershed Park Trails.